CUSTOM DESIGNED means more than choosing a setting and selecting a stone. It means creating something that was always destined to be yours. Maybe you know exactly what you want. Maybe you need some inspiration. Our first role as designers is to get a clear sense of what makes you tick – do you prefer the bold, the bright, the bigger the better? Do you prefer the delicate, the intricate, the subtle and sweet? Before you book a consultation, spend some time thinking about the things you like, the things you love; your favourite artist, designer, architect or artistic movement. Your first consultation is a fact-finding mission. We discuss the things you like, love, hate and are indifferent to. We look at the photos and sketches you have accumulated since STEP ONE; including any old jewellery you are hoping to incorporate or redesign. We are happy to discuss the jewellery designs of other artists, use them as a jumping off point and see them as inspiration – but please don’t ask us to reproduce another designer’s work for less neither for more. That’s not what we do. We discuss the stones you hope to use, whether supplied by you or sourced by us. We talk numbers. Our estimates are based on a simple equation of labour + materials; we work exclusively in 18k gold and platinum (sometimes 14k), using only natural gemstones. 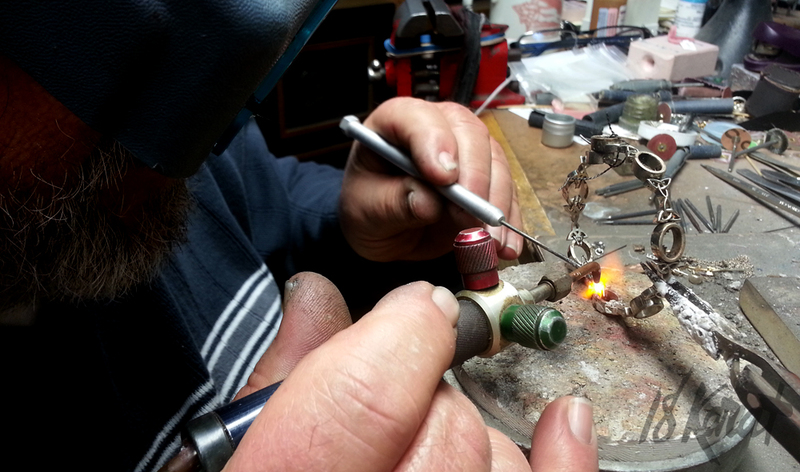 Our in-house Master Goldsmith Dino Giannetti has been working at the bench since the early 1970’s, he is a second-generation goldsmith with more experience and hands-on knowledge than most; quite simply, he is the best at what he does. 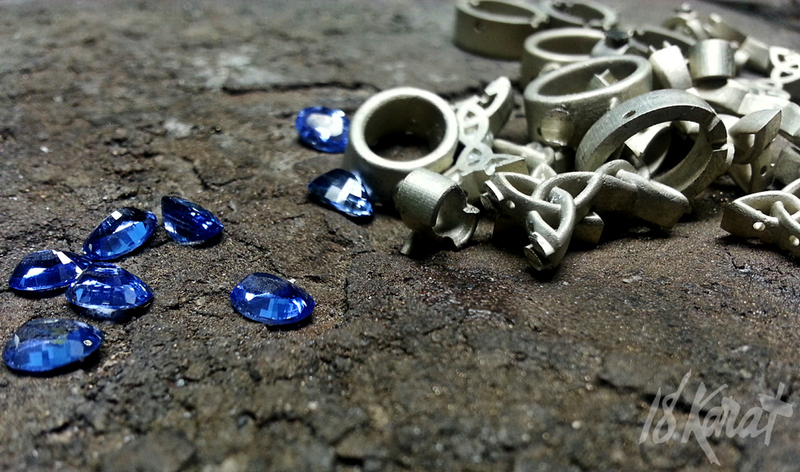 We have never desired to be the cheapest, but to create jewellery we are proud to stamp with our maker’s mark. Once we have narrowed in on a concept and design, we require a $250 design deposit – this deposit allows us to spend the time to create a design through 3D CAD rendering and/or wax model. This deposit will be deducted from the final price of your project. With over 40 years of experience designing and creating fine jewellery pieces, we have the distinct advantage of being able to combine old techniques with modern technologies; tried and true old-school Italian goldsmithing coupled with modern CAD and 3D modelling. In most cases, we work closely with a digital designer to produce a rendering of your design before creating a to scale wax model. This allows us an accurate visual representation of what the finished piece will look like and allows us the flexibility of tweaking the design and making any necessary changes. In other cases, for example those involving unusual stone shapes and sizes, we will carve a wax model by hand. Both methods result in a perfectly size, to scale model of your jewellery piece – one that you can touch, fell and even try on. Once you have confirmed your design, we require a 50% deposit in order to begin work. In general, it can take between 4 – 6 weeks to complete. If you have a specific due date in mind, for example a birthday or engagement, please let us know during your consultation. 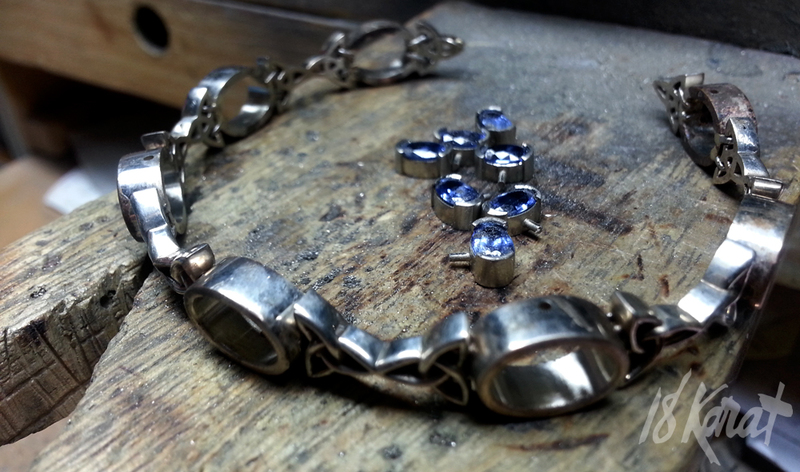 For more information on how our jewellery is made or to get some inspiration from our Custom Made Gallery. 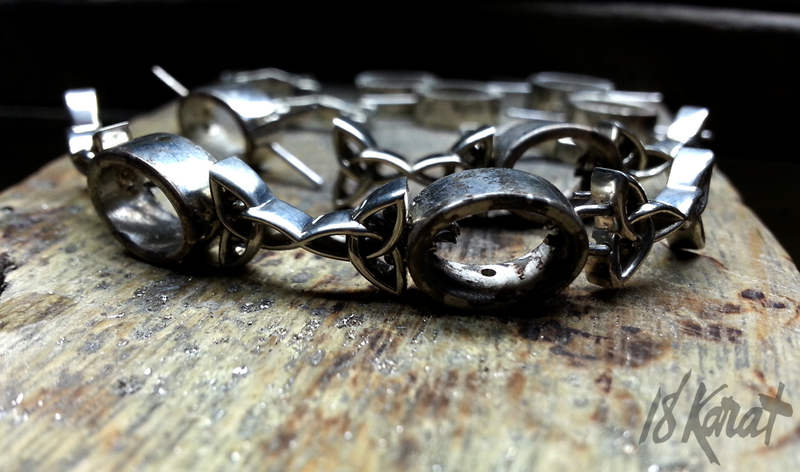 Rough 18k white gold components, straight from casting. The castings have been individually hand-cleaned and polished. 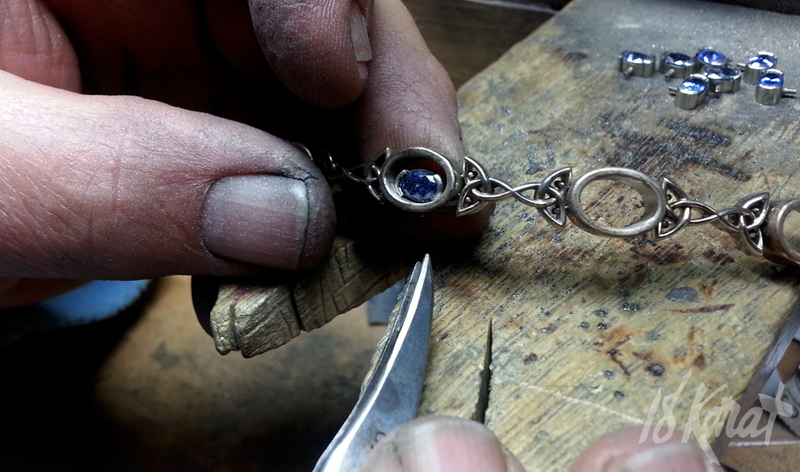 They are now being assembled and soldered into place. Each piece is hand-assembled with white gold loops connecting each link to the next. 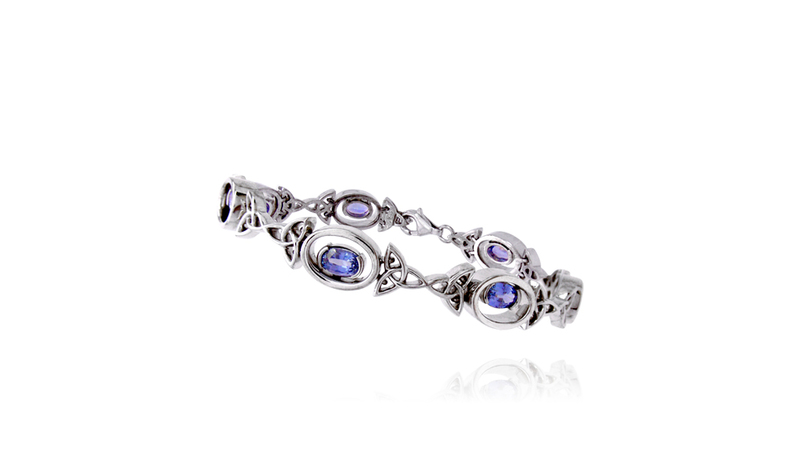 Each oval sapphire is individually set in a half-bezel setting. 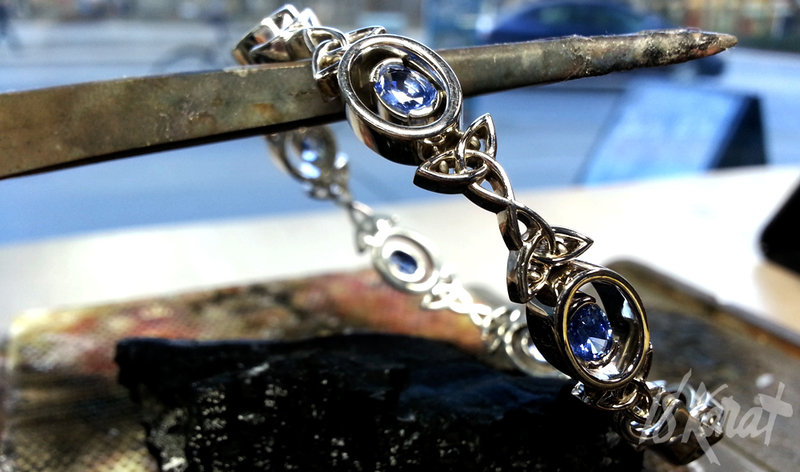 Each stone is alternately-set, one above and below, and soldered into place. If you are interested in booking your consultation, take a minute to view our Custom Made Gallery.